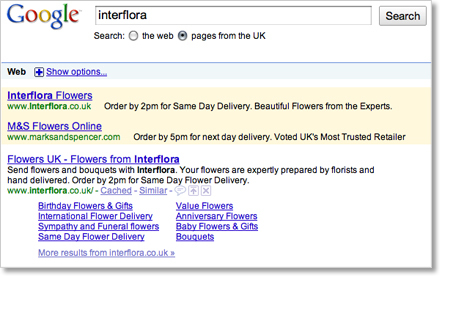 How ethical is it for Marks & Spencer to use the Interflora as a search term in Google AdWords? Just take a look at the screen grab above… I did a Google search for ‘Interflora’ and the AdWord results show links for Interflora and for Marks & Spencer. So what I hear you ask?! Well, some people at Interflora are shouting ‘unfair’… and I can see their point! But it’s all above board. A recent ruling from Europe’s top court states that advertisers are free to use their rivals’ trade marks to bring up their own adverts on search engines. See this interesting article from Mishcon de Reya – it’s a fascinating read and certainly opens up a can of worms… I doubt this will be the end of this story!